One winery we visited yesterday was hosting the Wings Over Wine Country awareness for injured animals for the Wildlife Center of Virginia. The organization brought along a few animals. 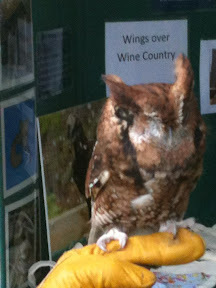 including the screech owl in this picture. This owl is missing one eye and the other is damaged rendering her effectively blind. They believe she may have been hit by a car or a train. he was found along railroad tracks near an intersection. Now she is a permanent ambassador to raise awareness for injured animals. It is amazing what one finds while spending a great day sampling the fruits of the vine.